Preds Poll: Who is Nashville's Biggest Rival? Preds Poll: Who is Nashville’s Biggest Rival? The Nashville Predators have only been playing hockey since 1998, but there are some rivalries that have been forged. 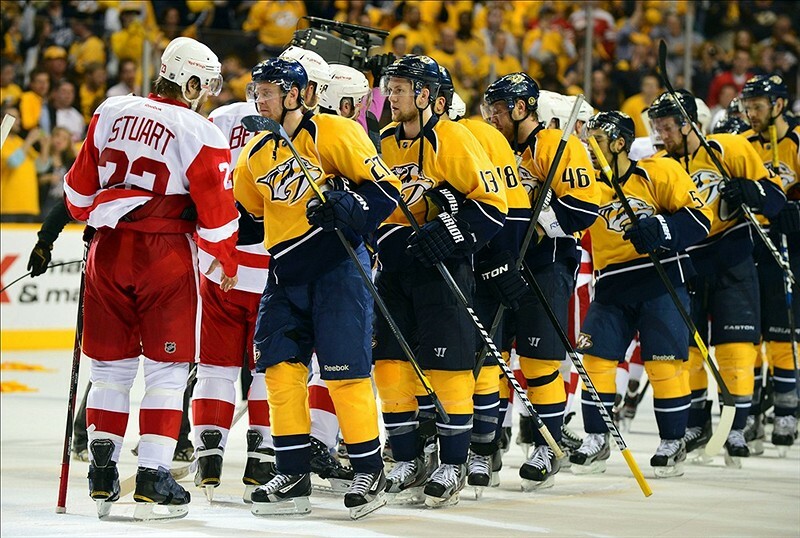 The one question is who is Nashville’s biggest rival? We break down the teams and make a case why they’re rivals with the Predators. The one team that popped up the most was the Chicago Blackhawks. Most of the answers I got when I asked the question on Twitter said the Stanley Cup champions. The Hawks are a team has the championship pedigree that everyone wants to take down a notch. Chicago fans are notorious for trying to invade the Bridgestone Arena to turn it to quasi-home game. A segment of Blackhawks fans have been quick to dismiss the viability of Nashville as a hockey market, and that only fuels the vitriol between the cities. Nashville fans would love nothing more than to see the club finally take down Chicago in a playoff series. The teams have only been in the same division for the last two seasons, so there really hasn’t been much of a history between them. That could change with time. However, it did get off to a nasty start after Steve Downie’s high hit on Roman Josi in the 2013-14 season. The Blue Jackets never really had a rival their first few years in the NHL, but the two clubs would always play close games against each other. The rivalry was a budding one, but that was ended due to realignment. These two teams have a lot in common as they are Southern teams that are in non-traditional markets. Both have talented young players with bright futures ahead of them. Polls on the On the Forecheck website thought Dallas would become Nashville’s biggest rival. The Stars have the looks of a dynamic offense, while the Predators have one of the best defenses in the NHL. Polar opposite playing styles usually make for good rivalries. This rivalry stemmed from the amount of auto workers that migrated to Tennessee from the Motor City. The two teams used to play each other up to eight times a season and pushed each other hard when they were in the Central Division. Some still think Detroit is still Nashville’s biggest rival, but that is quickly fading because they only play each other twice a season due to realignment. However, there’s no doubt that the Red Wings coming to town is still a pretty big deal. This could stem from Ryan Suter spurning Nashville to take a big-money deal with division-rival Minnesota. That deal got former coach Barry Trotz fired up and he accused the Wild of “stealing” Suter. There’s also the storyline of former owner Craig Leipold selling the Preds to only turn around to buy the Wild. He had a deal in place that would sell the team to BlackBerry’s Jim Balsille that would move the team. That deal fell through, but was sold when Predators Holdings, LLC came to the rescue. Leipold claimed that he suffered some big losses because he thought hockey couldn’t work in Smashville. The Predators are on stable footing now, but there’s some resentment in Nashville over his actions. There are a couple of things that would qualify that as a rivalry. We all remember it was the Flyers that signed Shea Weber to that monstrous 14-year, $110 million offer sheet in the 2012 offseason. That move forced Nashville to pour a lot of money into a player that it could not afford to lose. Some Preds fans still dislike what Flyers management tried to do in getting their beloved captain. There’s also the connection of former Philadelphia coach Peter Laviolette is now coaching the Predators. Laviolette now has a defense that he didn’t really have in Philly. Another fan base that tries to invade Nashville is that of the St. Louis Blues. Both teams have been in the same division since the Preds joined the league, and there have been a lot of scraps between the two clubs. Even St. Louis superstar Vladimir Tarasenko got into the act with Nashville defenseman Ryan Ellis. There will also be the added element of longtime Blue Barret Jackman signing with the Predators. That could add some fireworks. This makes sense due to the fact that former longtime Predators coach Barry Trotz is now the bench boss for the Caps. There’s naturally going to be some sort of comparison between the two teams, but it’s still a friendly one. The teams are also connected due the trade the sent Filip Forsberg to the Music City. Both teams surpassed expectations in the 2014-15 and made the playoffs. Both are small market clubs that stockpile young players and draft smartly. There hasn’t been a moment that has tossed this into a hate-fest, but that could come in the hotly-contested Central. Is there someone I missed? Let me know who and why that team should be Nashville’s biggest rival. 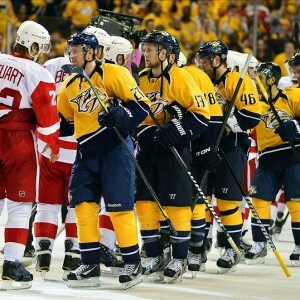 Who is the Nashville Predators biggest rival? Dan Mount is a Nashville Predators staff writer for The Hockey Writers. You can follow him on Twitter, @DanMountSports.